As soon as I started thinking about this problem, I realized that I was facing an iceberg: there were so many things I need to figure out to better understand the user as well as the problem. I tried to google the Acme and the three restaurants to find real users. However, I failed. Then I realized that the biggest challenge was that I couldn't get in touch with real users. So, how can I guide my design direction? The personas helped me to develop a clear picture of who the design of the app would target in this design challenge. Because of time intense, I mainly focus on the two primary user groups. However, for future development, the needs of secondary user group should also be taken into consideration. 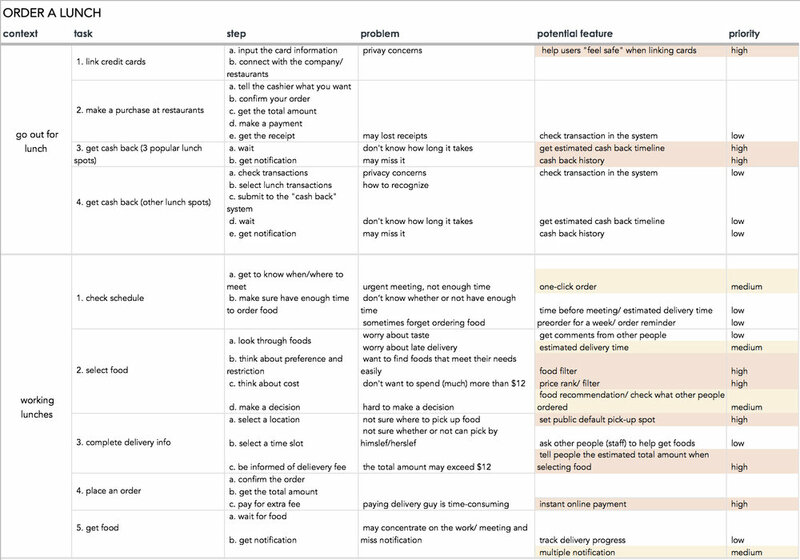 So, back to users and goals, how to help employees order lunch and enjoy their $12 lunch stipend everyday? What's the problem? How to use the lunch stipend? Walked in users' shoes. I walked through these two user flows and marked problems as well as the potential solutions on the diagram. For people who has tight time schedule and always order food online. I concentrate on the food ordering flow and the main design goal was to help them save time. For people who always go out for lunches. I made an assumption that they mainly go to the three popular lunch spots for food. So I mainly focus on the payment process, trying to synthesize the using lunch stipend process within the original flow. The design goal was to let people concentrate on their purchasing tasks and not adding too much extra steps to use the lunch stipend. Based on the design goals, I came up with 6 design alternatives. I marked trade-offs on each of the design alternatives to help me make a decision. Finally, considering about users' needs, business values as well as technical restrictions, I selected the 6th design alternative for further development. Firstly, it requires less steps and doesn't break the original flow. Secondly, it doesn't require the restaurants to provide extra services to use this system. Therefore, the company can add more restaurants to the food ordering system in the future. Thirdly, it can be synthesized in the online food ordering system which helps reduce the development cost and unified the experience across two use cases (online and in-store). After reorganizing the two typical user flows, I tried to figure out the requirements and came up with potential features. Combing through all the research and brainstorming the different things people do before, during and after ordering food allowed me to come up with a broad set of tasks quickly. I categorised and segmented the tasks into behavioural affinities and aligned content, problems and features. This gave me a way to visualise what functionality and content would be useful, what tasks needed supporting, and also what opportunities were available to innovate. Afterwards, I entered all the ideas into a spreadsheet and prioritised them against the personas needs, tech feasibility, and business objectives. For this design challenge, I would only design to fulfill the features with high /medium priority because of time constraints. Since ordering food is a high-frequency task and happened in office context, I finally decided to design a website. Besides, it provides more opportunities to perform version iterations. Considering about what I know about the context and the user goals, I mapped all the information I need to present in the menu page first. Then I did some experiments of laying out components and came up with 9 design alternatives. So how can I make my decision? Which one should be further developed? At last I gave up the idea of showing the cart component on the menu page since I wanted the user to focus on his/her food selection task. Besides, given the situation that we only have about three restaurants that users can choose, I designed a list to show all the restaurants in the left side of the screen instead of a whole page of restaurant cards. Then I created a higher-fidelity of the wireframe with more details. After the above steps, I have identified many opportunities to improve the food ordering experience. However, due to the constraint of time I have to narrow down my design topics by referring back to user’s main tasks and the product mission. For this design challenge, I decided to mainly improve the process of selecting and ordering food,since they are the major tasks of the users. Due to the time limit, many design decisions in this design challenge were made based on several casual interviews and assumptions. If time allows, more user research and task-based user testing should be done to get solid insights and feedback. Will users understand all these filters when selecting restaurants and food? What if users failed to find food that meet their needs? Do first time users feel the flow intuitive and easy to use? What about the edge cases? What if users order their lunches online and in-store at the same time? Moreover, how can I improve the accessibility of this system? Then based on the feedback from real users, more iterations should be conducted to polish the design in the future.